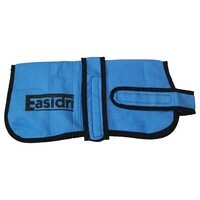 EasiDri Cooling Coat helps hold in cooling moisture without wetting your dog's coat. This unique coat has been specially designed to cool the coat as water slowly evaporates. Simply use in hot weather to keep your dog cool and at ease. This tough and durable EasiDri Cooling Coat resists tearing and shredding, and includes adjustable chest and stomach straps with touch and close fastenings. This high performance Cooling Coat is machine washable and come with a resealable bag for hygienic storage. Please Note: Returns of this coat will not be accepted if the product has been soaked due to health and hygiene reasons. Please ensure the coat fits your dog correctly before applying any additional water. Wonderful product. I recently took the plunge and invested in two of these cooling coats, best thing I did. Yes they're a bit pricey but they've been invaluable esp on holiday as it's been so hot. Dogs instantly stop panting and are so comfortable. I would recommend to anyone esp if you do uk holidays or lots of days out with your dogs. I want one! Brilliant product! Dogs love wearing this and you can see the look of total relief in hot weather! The dog doesn't get wet with it on but they certainly stay super cool - I've even got a client with one for their greyhound! This coat is absolutely wonderful! I have a French Bulldog and this coat keeps him very comfortable in the heat. I live in South West France where the summers are very hot. At dog shows, when other Frenchies are lying in the shade panting, Dylan happily strolls around the show ground as cool as a cucumber! out of all the dog cooling coats on the market this coat is probably the best one, really helps my dog in the hot weather, walking, in car travel and around the house.